Salvia mellifera Terra Seca has wonderfully fragrant foliage. Salvia mellifera is often mentioned as the best sage for making sage honey. Rating a plant for fire danger is partly due to the volatility of the material and partly due to the volume of air within the plant when fire is present. A prostrate variety like Salvia Terra Seca is going to be less of a fire hazard because the plants are lower to the ground. A five year old plant is 18" tall in one of our gardens and has spread to 8 feet in diameter. Salvia Terra Seca is hardy into the teens. Salvia mellifera Terra Seca is a great nectar source for the Painted Lady, Mournful Duskywing, California Dogface Butterfly, Cloudless Sulfur and the Northern White Skipper and is a nice addition to the Butterfly Garden as well as the Hummingbird Garden. 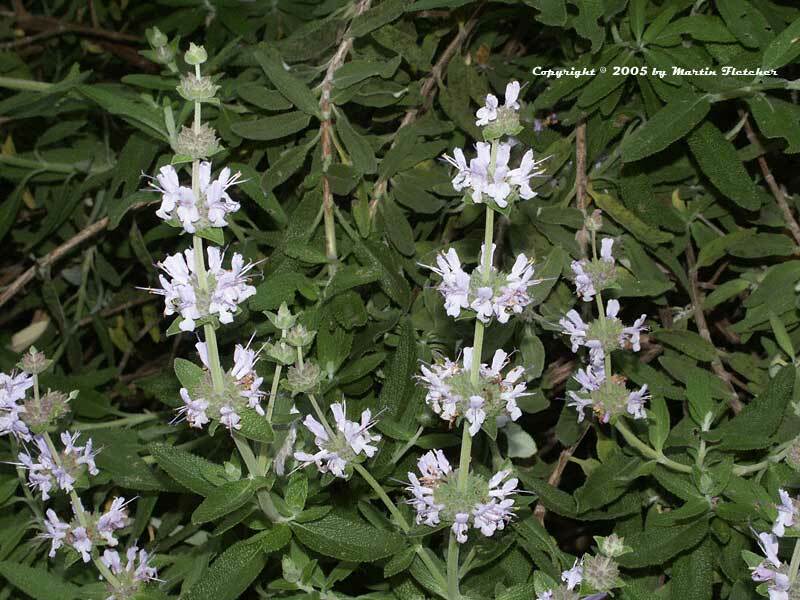 High resolution photos of Salvia mellifera Terra Seca are part of our garden image collection.